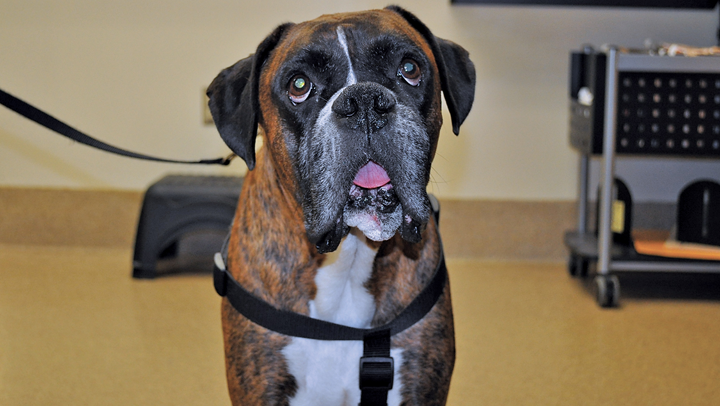 An 11-year-old, neutered male boxer was referred with an oral mass of several weeks duration. No other clinical signs were present. General physical examination revealed no abnormalities. Vital signs were within normal limits. Oral examination disclosed a firm, fleshy mass 2.5 cm in diameter on the rostral mandible at the level of the incisors (Figure 1). Palpation of the mandible elicited no apparent pain. Except for 103, all lower incisors were missing or could not be visualized. 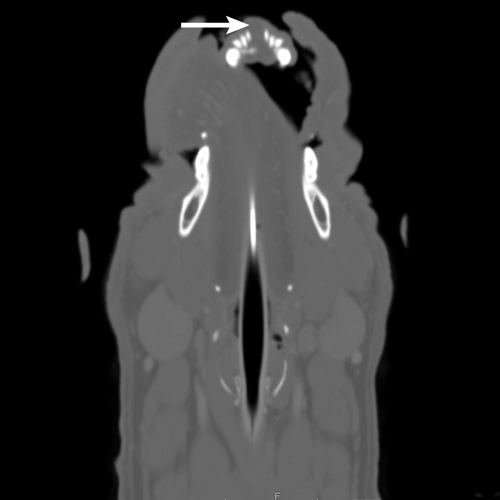 Figure 2 Axial CT image of the head showing an oral mass (arrow) of the rostral mandible. Note the mild lysis of the mandible and widening of the interdental space between the left and right mandibular first incisors. CBC and serum chemistry profile were within normal limits. Three-view thoracic radiographs were negative for metastatic disease. The patient was anesthetized, and CT of the head and thorax and an incisional biopsy were pursued in the same anesthetic period. The CT scan showed a well-defined, 2.2 x 2.5 x 1.4-cm noncontrast-enhancing, soft-tissue–attenuating mass on the rostral dorsal aspect of the mandible at the level of the incisor teeth, with mild lysis of the mandible and widening of the interdental space at the mandibular symphysis (Figures 2 and 3). The mandibular and retropharyngeal lymph nodes (the most important lymphatic centers for a tumor in this region) and other lymph nodes of the head and neck appeared normal. The surgeon used an intraoral approach to obtain a wedge biopsy from the center of the mass. The tissues around the mass were undisturbed, and the oral mucosa was closed using 3-0 PDS in a simple interrupted pattern. 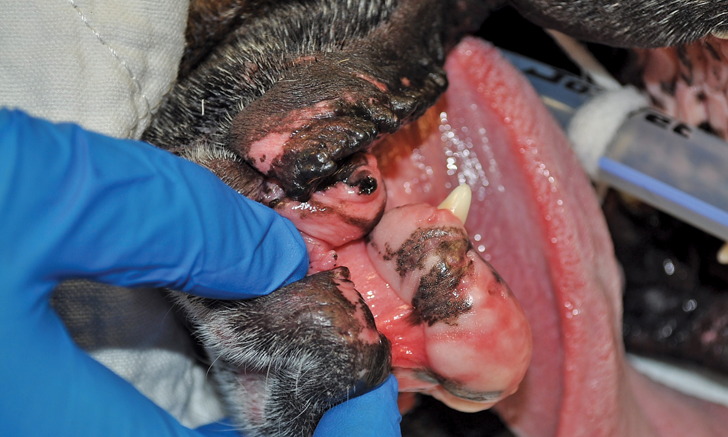 What are the most common oral tumors diagnosed in dogs, and what is the best method to diagnose them? If this were a malignant tumor (ie, any oral tumor other than an acanthomatous ameloblastoma), what additional diagnostic test should be performed as part of tumor staging? What is the prognosis for an acanthomatous ameloblastoma that is excised with clean margins? Why does bone need to be removed for excision of oral tumors? Surgery is the gold standard treatment for a small tumor with a rostral location. The following week, the patient underwent wide excision of the mass with 2-cm margins based on the visible tumor mass and CT scan findings. Cross-match and blood typing were performed preoperatively, and a mandibular nerve block was administered bilaterally before the procedure. The surgeon used an oscillating bone saw to perform a bilateral rostral mandibulectomy (Figures 4 and 5). For closure, the gingival mucosa was attached to the lingual mucosa with an absorbable suture in a simple continuous suture pattern. A triangle of skin was excised from the midline to remove redundant tissue from the chin. Subcutaneous tissue was closed over the ends of the mandible to prevent protrusion through the closure. The skin was closed maintaining the continuity of the mucocutaneous junction. Figure 4 Preoperative positioning of the patient in dorsal recumbency. Pharyngeal swabs have been placed to prevent aspiration of blood; blue synthetic fibers assist with removal of swabs. Figure 5 Dissection of the soft tissue from the rostral mandible and mandibulectomy using 2-cm margins with an oscillating saw. Saline flushes were used to prevent overheating of the bone with the oscillating saw. Figure 6 The biopsy specimen postoperatively. The cut edges of the mandible are inked with yellow tissue ink for evaluation of the margins of excision. The patient recovered without incident and was admitted to the ICU for supportive care with IV fluids and meloxicam (0.1 mg/kg IV once a day) and hydromorphone (0.1 mg/kg IV every 4-6 hours) for pain control. The surgical margins were inked, and the entire specimen was submitted for histopathology and margin assessment (Figure 6). Histopathology confirmed acanthomatous ameloblastoma. The margins of excision were considered clean, with no evidence of tumor cells within >10 mm of the inked surgical margins. The patient was eating soft food within 24 hours of surgery and was discharged 48 hours postoperatively. The owner was advised to feed the patient canned food, as well as avoid offering toys or hard treats, for 1 month. At suture removal 12 days postoperatively, the patient showed no abnormalities and was eating without difficulty. Cosmesis and function were considered excellent (Figure 7). The most common oral tumors in dogs are malignant melanoma, squamous cell carcinoma, odontogenic tumors (eg, acanthomatous ameloblastoma, epulides), fibrosarcoma, and osteosarcoma.4,5 Oral masses are discovered through owner observation of halitosis, drooling, inappetence, reluctance to eat hard food, oral pain, or bloody oral discharge or on routine dental examination and prophylaxis; an incisional punch or wedge biopsy specimen should be obtained during these procedures. 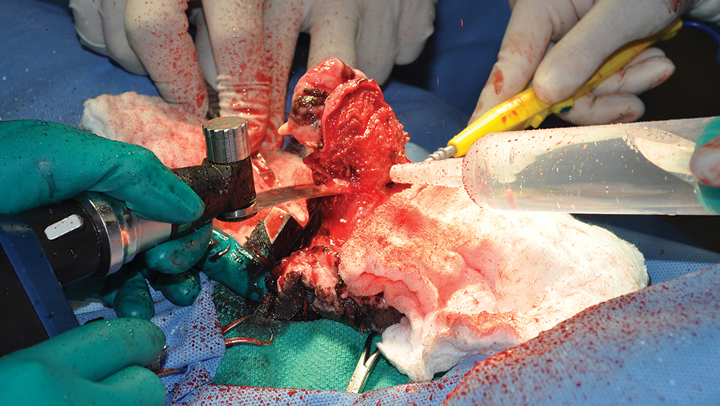 To ensure that definitive excision is based on the known extent of the tumor, the tumor should be left intact and its architecture not disrupted. Oral tumors should be biopsied via incisional biopsy in the oral cavity and not through the lip or skin of the cheek. Depending on the animal and the mass location, biopsy sometimes can be performed using only heavy sedation because the tumor tissue lacks sensation. The masses should not be shaved or cytoreduced to the point that their original location and extent cannot be determined. Oral mucosa can heal quickly; healing after marginal excision of an oral mass may make it difficult to determine the original tumor location and hinder planning of the clean margins required for successful excision. Because this tumor type is locally aggressive but does not have metastatic potential, and because the margins of excision are complete, the prognosis for this dog is excellent with a high chance of cure. See Table for the 1-year survival rates reported for dogs with common oral tumors. Bone must be removed for a successful excision of an oral tumor with bone invasion either because the bone acts as the deep fascial margin or, in most cases, because the bone has been invaded by or arises from the tumor. The functional outcome for most mandibulectomies and maxillectomies in dogs is excellent. Murray RL, Aitken ML, Gottfried SD. 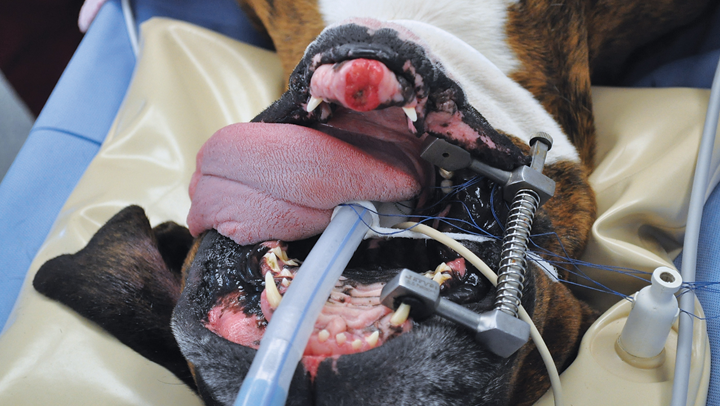 The use of rim excision as a treatment for canine acanthomatous ameloblastoma.JAAHA. 2010;46(2):91-96. Mayer MN, Anthony JM. 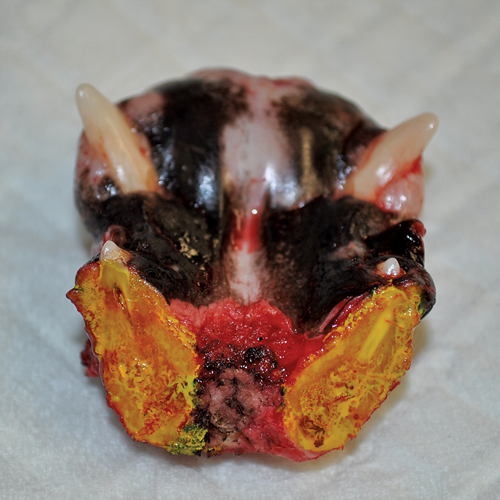 Radiation therapy for oral tumors: canine acanthomatous ameloblastoma.Can Vet J. 2007;48(1):99-101. Kelly JM, Belding BA, Schaefer AK. Acanthomatous ameloblastoma in dogs treated with intralesional bleomycin.Vet Comp Oncol. 2010;8(2):81-86. Liptak JM, Withrow SJ. Cancer of the gastrointestinal tract. In: Withrow SJ, Vail DM, Page RL, eds.Small Animal Clinical Oncology. 5th ed. St Louis, MO: Elsevier Saunders; 2013:381-398. Liptak JM, Lascelles BDX. Oral tumors. In: Kudnig ST, Sguin B, eds.Veterinary Surgical Oncology. Ames, IA: Wiley-Blackwell; 2012:119-179. Williams LE, Packer RA. Association between lymph node size and metastasis in dogs with oral malignant melanoma: 100 cases (1987-2001).JAVMA. 2003;222(9):1234-1236. Skinner OT, Boston SE, Souza CH. 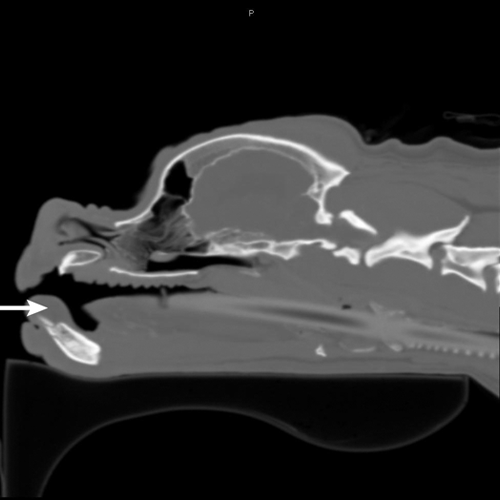 Patterns of lymph node metastasis identified following bilateral mandibular and medial retropharyngeal lymphadenectomy in 31 dogs with malignancies of the head [published online ahead of print]. May 16, 2016.Vet Comp Oncol. doi:10.1111/vco.12229.